Jamie Foxx and Leonardo Di Caprio in Quentin Tarantino’s ode to westploitation, ‘Django Unchained’. With the campy, violent, tongue-in-cheek pulp western Django Unchained, Quentin Tarantino comes at us full-tilt, both guns appropriately blazing. Hollywood’s most idiosyncratic working director seems intent on one-upping himself, doing to America’s shameful history with slavery what he did for Nazis in Inglorious Basterds, and then some. Be prepared to squirm in your seat. Tarantino name-checks Sergio Corbucci’s classic 1966 spaghetti western Django, going so far as to feature its star, Franco Nero, in a cameo and to use its melancholic-yet-poppy theme song over the opening credits of a chain gang of slaves as it is lead across Texas circa 1958. This tableau is soon broken by Dr. King Schultz (Christoph Waltz, who won an Academy Award for his performance in Basterds), a verbose German dentist-turned-bounty hunter seeking one specific slave, Django (Jamie Foxx), who can help him identify and take down the notorious Brittle Brothers in exchange for freedom and a share of the bounty. Christoph Walt as Dr. King Schultz. Just as their partnership is set to close, Schultz learns that Django plans to use his share of the money to purchase the freedom of his wife, Broomhilda von Shaft (Kerry Washington), held on a plantation deep in the heart of Mississippi. 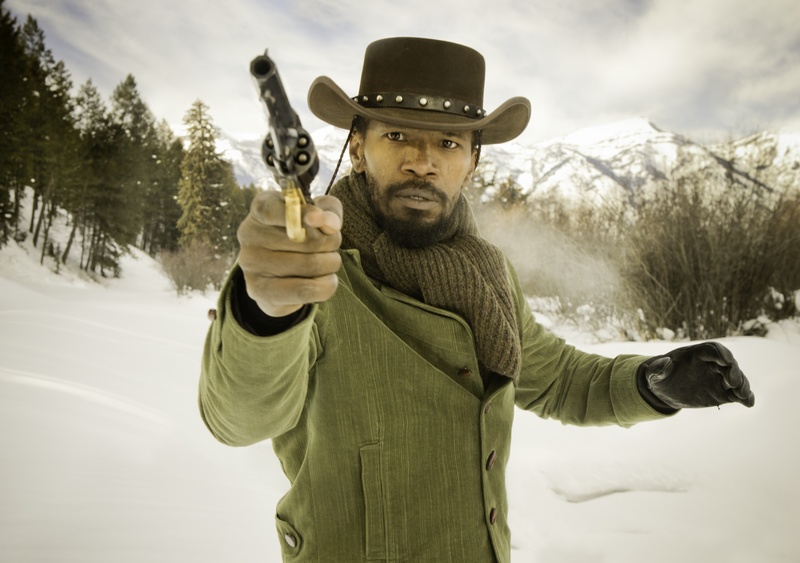 Schultz’s conscience won’t allow him to let his partner to venture into a place where no black man — free or otherwise — should go alone, so he convinces Django to work with him through the winter, honing his skills and learning to read in the process, in exchange for helping the man free his wife. What else can a good German do? She’s named Broomhilda and Django is a real-life Siegfried, after all. Hildy is the property of Calvin Candie (Leonardo Di Caprio), the oily owner of a plantation called Candyland and a specialist in training and trading slaves for bare-knuckle death matches. To get to her, Django and Schultz have to pose as black slaver and a white buyer. They make an unlikely but believable duo, thanks to Tarantino’s signature brand of characterization and the performances of Foxx and Waltz, who share an easy and natural rapport onscreen that makes one wish for Django and Schultz: The Early Years. Waltz definitely gets the flashier role, and his genteel Old World charmer plays like Basterds‘ Colonel Landa using his powers for good instead of evil. Foxx does a nice slow burn as the stoic killer, a man of few words and fast action in the Man With No Name mold. Overall, Django Unchained is a startling, funny, shocking, bloody, operatic, and thoroughly subversive piece of pop art. The N-word flies more often than the bullets (and there are plenty of those, too), blood flows by the gallon, and no antebellum atrocity is left unexposed. There is a point to it all, though, and the perversity, horror, and indignity is explored throughout its hefty 165-minute running time. In a way, QT has outdone Spielberg’s comparatively anemic Lincoln. Django Unchained doesn’t flow as smoothly as some of the director’s more accomplished works (possibly to the untimely passing of his long-time editor Sally Menke) and it lacks his usual array of vividly drawn characters. It still has plenty of his trademark tics — super-cool dialogue, a well-curated vintage ’70s soundtrack, Mexican standoffs, etc. — and while it may not boast his usual polish, it is nevertheless quintessential Tarantino, and cathartic at that.